Manual hydraulic freestanding drum lifter to suit both steel and plastic drum up to 400kg in weight with 1070mm lift height. 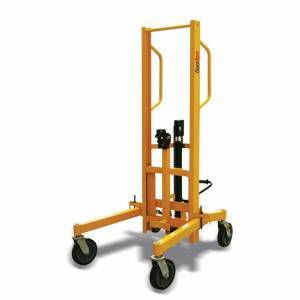 Think the freight price is crazy on the drum lifter? Unfortunately they are big and bulky and expensive to freight. If you have your own freight carrier and you can do cheaper we are happy for you to arrange pickup from Melbourne, Brisbane or Perth! Heavy lift capacity crane rotator suitable for mining operations, manufacturers and foundries. The proven design of the forklift rotator has been extended to the crane rotator. The drum is quickly clamped in the holder by eccentric lock with 360 degree rotation.